A few years have passed since The Phork opened and closed its doors. 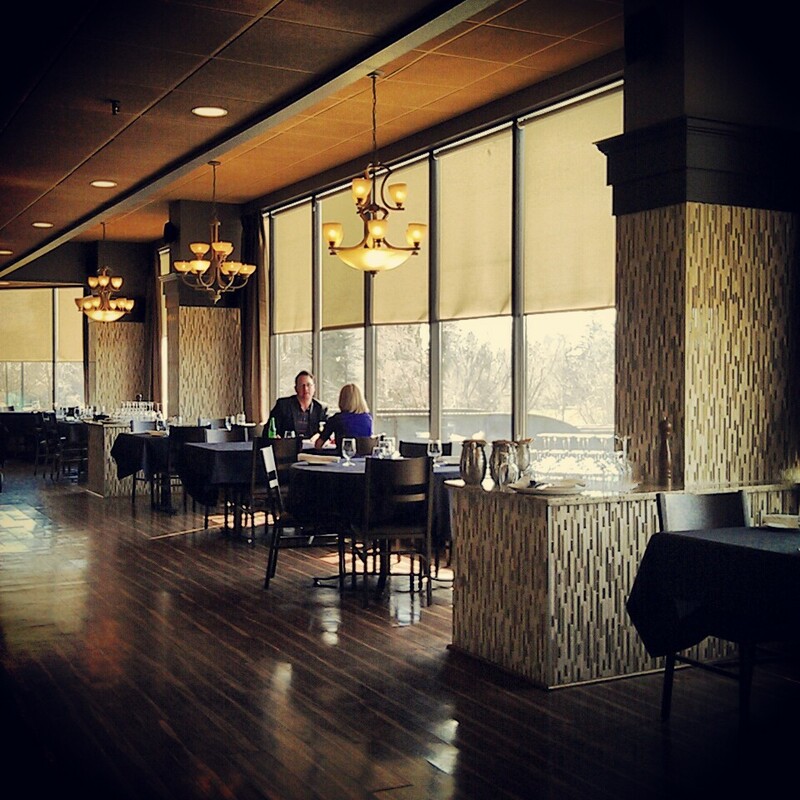 The eatery sat on the raised main floor of the Ledgeview Business Centre on 97 Avenue and 110 Street. With panoramic views of Edmonton’s Legislature, the High Level Bridge, and the River Valley, it was a gorgeous location that deserved to be utilized. Yet, to my knowledge, it sat empty until now. The beginning of September marked the launch of The Butternut Tree and this venue’s chance at a second life. Although it had already been in business for a few weeks, the media event was only held this past Wednesday, and luckily, my boyfriend and I were invited as guests. After weeks of salivating over posts of their food on social media, I was extremely excited to acquaint myself with St. Albert-born Chef-Owner Scott Downey’s menu firsthand. Arriving at the building, we managed to snag the very last spot in their underground parking lot; however, there is also free parking available at an adjacent Impark lot as well as on the street after 6:00 pm. The logo embossed on the menu. Making our way up to the lobby, the entrance to the restaurant is marked by simple signage over a glass door. As soon as the threshold is crossed, there’s a host to greet patrons and a view of a handful of the windows that overlook Constable Ezio Faraone Park. As we were led through to our table, I observed the kitchen with its floor-to-ceiling glass walls that give diners a look behind the curtain. There are also only 58 seats in a 2,500 square foot dining room (including an eating area for private parties with its own separate entrance), providing everyone — servers and guests — ample space to breathe and move. The decor is somewhat sparse. Save for a painting hanging behind the bar at the far end of the room, the rest of the walls were pretty bare. 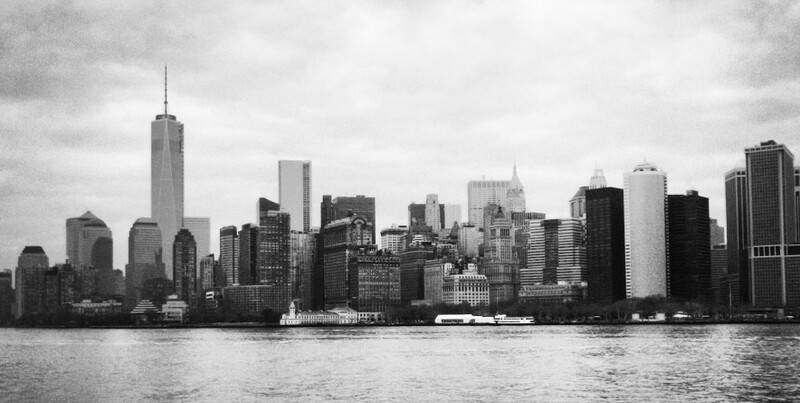 But, when there is such picturesque scenery outside, there isn’t really a need to dot the place with much else. The overall design was a mix of modern and rustic. Grey-brown wide plank floors, accent wood beams, vintage pendant lights, recessed lighting, black wood tables and matching vintage chairs set the mood. It felt somewhat homey while simultaneously coming across as an elevated ambiance. As the sun set, the room dimmed and candlelight took over; it became intimate and romantic despite the echoing din from those around us. On this occasion, we were given the choice of ordering à la carte or going with their tasting menu. The two of us opted to do the latter. Between the meat and vegetarian versions, many of the individual dishes were covered, albeit in smaller sizes to take into account the multiple courses. Therefore, we had the opportunity to try seven of the twelve plates off of the menu, along with a couple of creations only to be found in the table d’hôte. To drink, my boyfriend decided to try both of the beers — Farmer’s Daughter Pale Ale and Shotgun Wedding Brown Ale (my personal preference) — from Cochrane’s Half Hitch Brewing Company. I, on the other hand, chose to go with their Sumacade cocktail: sumac spice, lemon verbena, dandelion honey, soda, and Eau Claire Three Point Vodka. This one actually surprised me as the dandelion is what I picked up on the most; it made for a very botanic and floral Kool-Aid flavoured drink. The pretty and petite amuse bouches. Our meal then began with a palate prepping amuse bouche each: cured halibut for him and baby corn for me. Off the bat, I noticed how delicately they had been prepared and plated on their custom-made ceramics. They were almost too pretty to eat. After admiring them, we sampled the food. Since the halibut was cured, it was cooked, but it retained that raw fish texture. Paired with tart apple and edible flowers, it was a balance of herbaceousness and zest. The baby corn was tender while still remaining firm. It was covered in a thin layer of sauce and then sprinkled with dried and crushed flowers and salt. It was the perfect way to whet our appetite. The introductory course on the meat side was the Crab Tart whereby a rye crust was filled with crab in smoked crème fraîche and topped with unripe crab apple and herbs. It was way lighter than I expected. The rye shell was thin enough to imbue a deep, slightly sour flavour without overpowering the taste of the crab and the tart’s decorations. On the vegetarian side, dinner started with a dish of Kohlrabi. The bulbous stem was served as raw shavings in the salad, similar in flavour and texture to radishes and turnips. Just a tad crunchy and spicy as it married itself with the caraway, golden flax, and juniper. Both of us received the same second course of Grilled Bannock. A quick flat bread traditionally made by First Nations people, The Butternut Tree’s take reminded me of an open-faced English muffin piled high with wild mushrooms, berries, winged kelp, and pumpkin seed. It was probably one of my top dishes of the night even though I found the bannock to be overly charred. Initially, the burnt flavour was overwhelming; however, a couple more bites in and I saw how this seemingly simple plate was layered in a complex way to become earthy, sweet and nutty. Leaning towards the lighter side of what I considered to be our first entrées were the Miss Tatum Rockfish for my boyfriend and the Broccoli for me. The filet of rockfish was thick as it laid on a bed of Saskatchewan wild rice, beans, and herbs. The finishing touch was a separate cup of kelp broth poured over the bowl before our very eyes. By adding the broth just prior to eating, the kitchen avoided presenting a bowl of wilted greens and flowers. I do wish that the fish had been a bit more supple. Otherwise, it worked well with the produce. As I’m not one to pass up some good pork belly, I really would have liked to experience the Broccoli as listed under the appetizers on their à la carte menu. Alas, the vegetarian rendition of the recipe obviously did away with it. Funnily enough, they kept the duck egg though, and I’m glad they did. The soft boiled egg is the star of the dish. Covered in leek ash, it has a gritty looking texture to it. Yet, the flesh gives way easily to reveal one of the most beautiful runny yolks I’ve ever seen. Combined with pickled garlic scapes (the flower stalks of the garlic bulb) and cereal grains, this was likely my favourite offering of the evening. Our main dishes took a little longer to prepare. But, eventually, we were rewarded with my dish of Prairie Gardens Squash and his Bentley Bison Duo. I found that as an entrée, the squash wasn’t quite filling enough. I did like seeing the different ways in which the gourds were prepared as well as the use of the squash blossom (a soft, delicate, edible flower that grows from summer and winter squashes). The searing of the wilted spinach was another pleasant flavour profile. When I do go back to The Butternut Tree, I’d certainly be inclined to order the bison duo again. Both cuts of meat were succulent and juicy. Served with lentils, carrot, cauliflower, Saskatoon berry jus and some magical purée, it was heaven on a plate for me. Last, but never least, was dessert. My boyfriend’s tasting menu finished with the Cherry ice cream with bee pollen atop rolled rye grains. We enjoyed the ice cream, but we both agreed that the rye was way too crunchy and strong in flavour. The Plum: duo of plum fruit with milk ice cream fared much better. Compatibly integrated with an oat crumble and a marshmallowy, sticky honey meringue, this was a sweet ending to die for. As an extra, we gluttonously added on the Ployes Cake from their regular dessert menu. I had seen a photograph of it on their Instagram account, and I didn’t want to leave without trying it. Looking like a stack of pancakes, the dense cake’s taste emanated from the use of maple butter. On its own, it was seemingly bland. The whipped cream, flakes of Alberta rose, nuts and berries helped to give it some depth, but I still wasn’t satisfied. On closer inspection, I think the issue stemmed from the kitchen missing one of the main components: black currant jam. The jam was supposed to be sandwiched between each layer of the cake, and it was clear that it hadn’t been incorporated. I have no doubt that had the jam made an appearance, this would have been an excellent choice. Regardless of the few minor missteps we came across, this was a top notch meal that would be perfect for a special occasion. Chef Downey has taken what he’s learned from his time working with world-renowned Michelin-starred restaurants Daniel and Noma and applied those teachings to his own take on Canadian cuisine. Along with a phenomenal team, The Butternut Tree’s kitchen has shown us just how talented they truly are when showcasing their creations. I also have to give a huge shout out to the rest of the staff who kept the service running smoothly, and who also spend an inordinate amount of time polishing the silverware as every course comes with a new set of utensils. The late-summer opening of The Butternut Tree brings another welcome addition to the city’s burgeoning food scene. With a focus on global flavours made using unique ingredients that hail from our very own lands, this new restaurant exhibits a refined menu for those willing to go on a spectacular culinary adventure. The Phork (@thePhork) graced Edmonton with its presence at the end of 2013, opening its doors shortly before Christmas. Housed in the previous home of The Copper Pot, I was completely unaware of this new restaurant until I happened upon their deal on Groupon. It seems that the establishment was greeted with little fanfare upon debuting, so I count myself lucky to have come across the place in this fashion. Otherwise, I might not have found out about it until much later. Although I had the vouchers in hand, it still took me over three months to make my way there, perhaps because it seemed like a slightly out-of-the-way location. 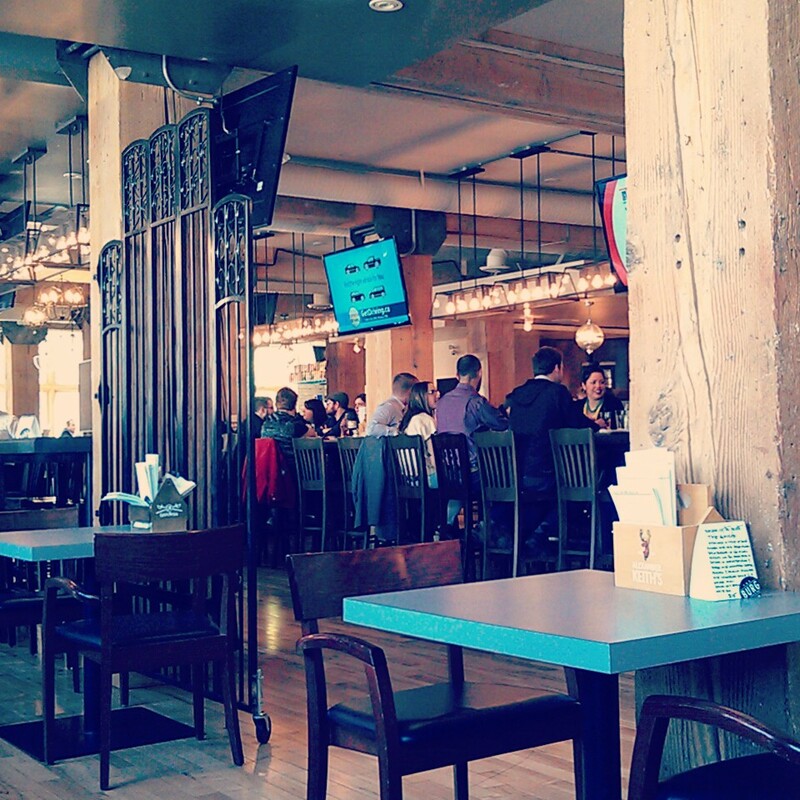 Situated near the Grandin LRT Station on the main floor of a small office building, it wasn’t close enough to work to make it there and back during my lunch hour, and it just never was the first to come to mind when making dinner plans during the week or on the weekend. However, after having been there twice now within the last month, I can say that I wish I hadn’t delayed going for as long as I did. My mother dined with me on both occasions, the first of which was a lunch outing. We had made a reservation through e-mail that time, but had also called ahead to ask about the parking situation. As it turns out, there is free parking available in the building’s underground parkade. The three or four visitor spaces are good to use during lunch hours while the remaining spots open up during the evening. I doubt that this is common knowledge as this information isn’t really advertised on their site. Yet, I think it certainly gives people more incentive to go, knowing that there is going to be somewhere to park their car in an area where parking may not be that easy to come by. 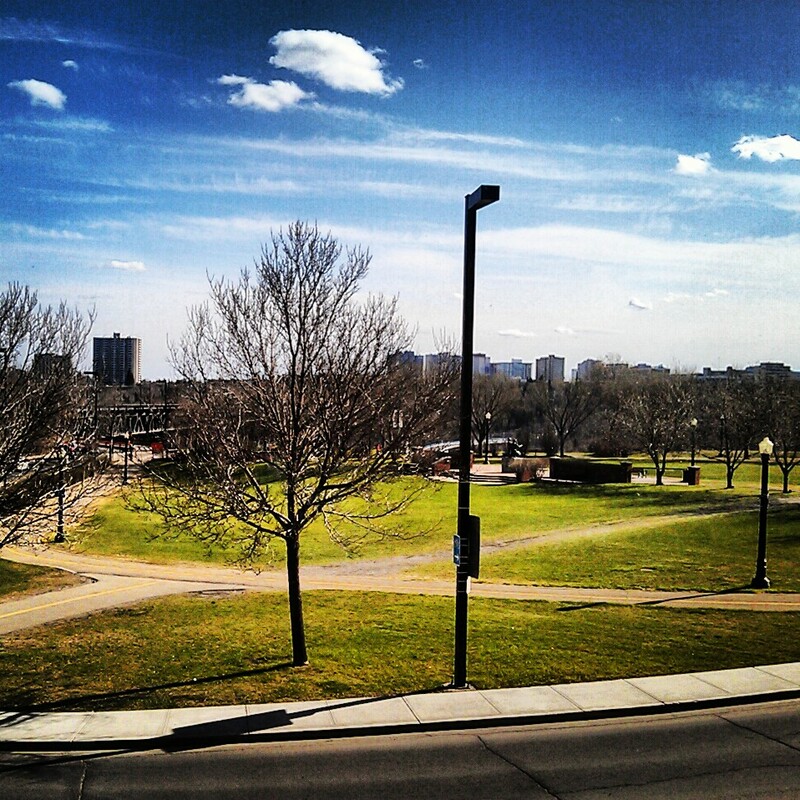 Views of the park, river valley and High Level Bridge. So, with that potential issue removed, we ventured into the restaurant where we were greeted quickly, although somewhat frantically, by a friendly guy who I learned later was Jameson the General Manager. Short staffed that day, he took on the role of server during lunch and promptly guided us to a raised booth that provided views of the High Level bridge and the park across the street. With about twenty or so tables that seat around four people each, it looked to be a quiet day as only a handful were being used. Despite that, I had high hopes. Skipping drinks as it was still very early in the afternoon, we opted to stick to the food menu. 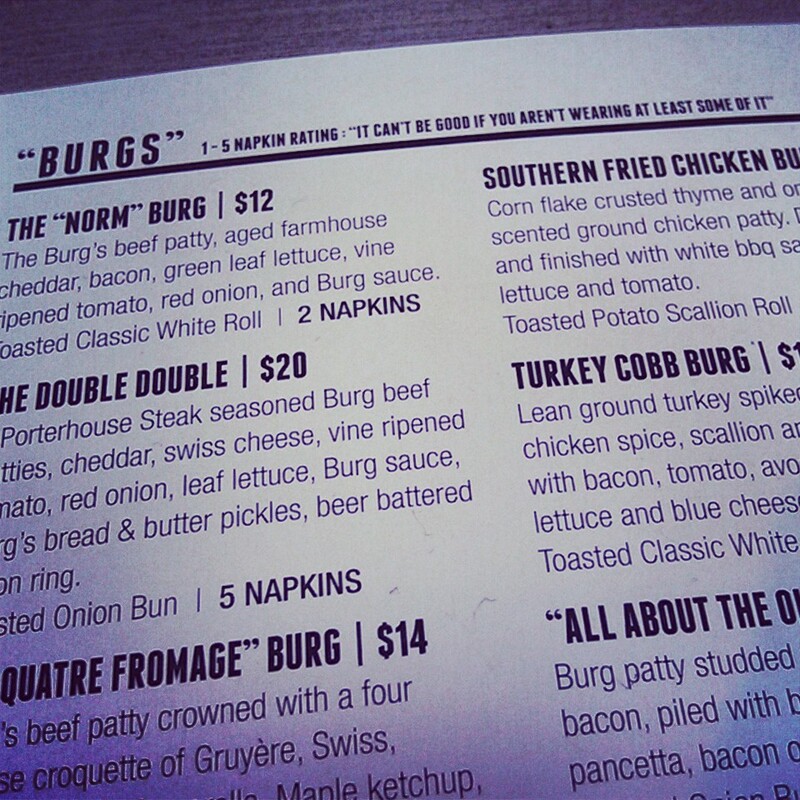 I ordered the Boar Belly Chicken Club and my mom decided to go with the Grilled New York Steak. Both of us chose the seafood chowder for our side. When our dishes arrived at the table, my initial thought was that the size of the soup bowl was massive. For a side, they are very generous, and the soup was really delicious. It wasn’t very thick, but you could certainly taste the cream and it had a slight spiciness to it. It was also chock-full of muscles, pieces of salmon, halibut or cod, shrimp and vegetables. It honestly seemed like a full size order of soup and could have served as my whole meal. I’m definitely not complaining though. I consider it to be a plus that they don’t skimp on the portions. With regards to my Boar Belly Chicken Club, it was quite delicious. I’m not certain what kind of bun they were using that day, but it was quite a crusty type of bread, which I am not that partial to, so I only ended up eating about half of the starch. However, I don’t feel that was a loss as it was a really large amount of bread and it wasn’t all necessary. The body of the sandwich included chicken breast, bacon (nicely crisped), which I’m guessing was the boar belly, aged cheddar, greens and tomato with bacon mayo. Overall, it may have been a little too salty for me when eaten whole. Yet, I enjoyed the strong smoky flavour and everything was well done. 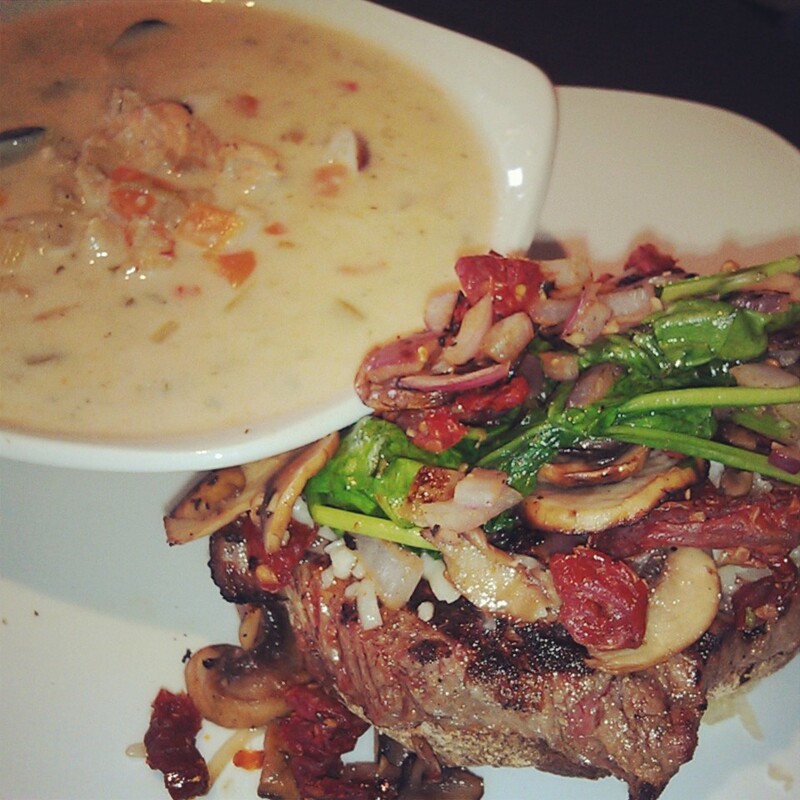 The Grilled New York Steak with a side of Seafood Chowder! The Grilled New York Steak was also a testament to the chef because it was cooked to perfection – incredibly tender and still pink. The meat sat on top of half an open-faced bun and was accompanied by sautéed mushrooms, Spanish onions, sun-dried tomato, spinach and Asiago cheese. I had several bites of it and it was so good. The different ingredients really melded together well and paired excellently with the steak. I would go back just for that. We finished off lunch with an absolutely wonderful peach and mango crumble. The dessert was my favourite, and the single order was more than enough to share. Filled to the brim with large chunks of peach and mango, layered with crumble, candied pecans and walnuts and coming with a scoop of vanilla ice cream, it was a great treat for a spring day. Simple, but decadent, I was no longer hungry when we left. If I can, I really do like to base my reviews off of more than one visit, so exactly a week later, we dropped in for dinner. This time, I reserved a table through the OpenTable system. As we arrived at 5:30 prior to the dinner rush (it was almost a full house by the time we left), we were promptly seated at a table next to the window. The view was basically the same as during our previous lunch, but I was now also able to see the Legislature building directly ahead of me as well as the High Level Bridge Streetcar passing by every so often. The interior of The Phork. Again, we opted to skip the drinks (Although, I will have to go back to try one of their tableside flare cocktails. They are served by local, professional flare bartenders and, according to their website, The Phork is the first and only restaurant in Edmonton to offer this service.) and concentrate on the food offerings (the supper menu is double-sided). Since Mother’s Day was coming up, we went all out and ordered three appetizers and a main to split, including Crispy Fried Truffled Mac & Cheese Balls, Smoked Jalapeno Blue Crab Cake, Beef Tenderloin Carpaccio and the Pistachio Crusted Rack of Lamb. I’ll start with the Mac & Cheese Balls. These were awesome. The breading on the outside reminded me of the Mac and Cheese Maki at The Hat, but with a more even ratio of panko to pasta. The spicy chili Ketchup, truffle oil and what I assume to be shaved Asiago cheese that accompanied the balls were excellent additions that really elevated the palate of the dish while keeping from being overpowering. The two Crab Cakes were seared well. Plated with a side of gathered greens and honey & mustard aioli, it was a light appetizer that had that great balance of piquant and sweet profiles. 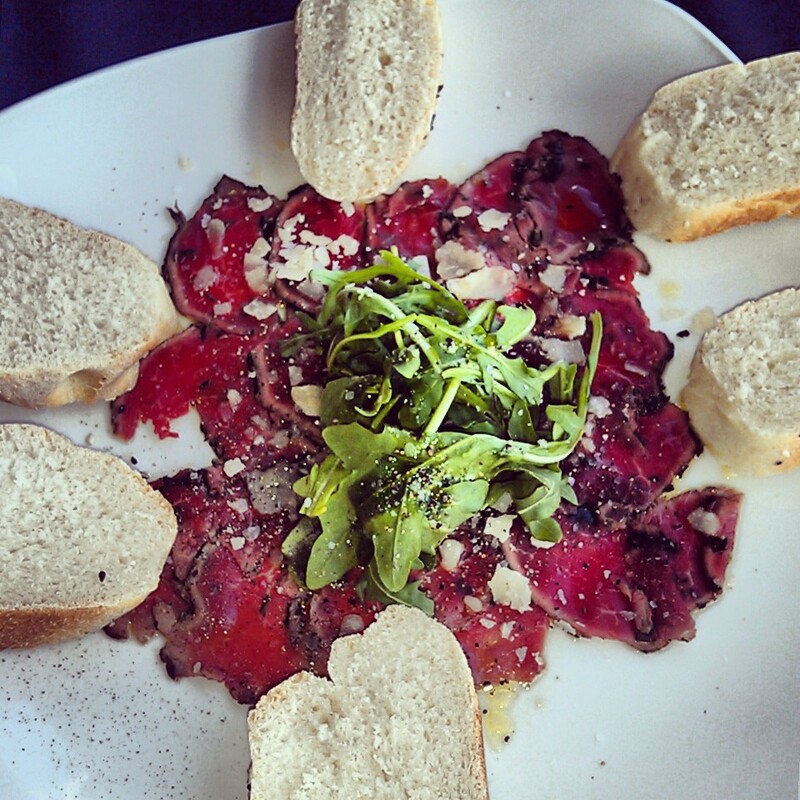 The Beef Carpaccio came with fresh slices of sesame seed topped bread and thin sheets of beef tenderloin topped with baby arugula, shaved reggiano cheese, a sprinkle of coarse sea salt and a drizzle of EVOO. The beef was melt-in-your-mouth good, and the flavours from the extras were subtle enough to ensure that the meat remained the focus. The view of the Legislature building from my seat. A close-up photo of the Crispy Fried Truffled Mac & Cheese Balls. The Pistachio Crusted Rack of Lamb! The Mac & Cheese Balls and the Smoked Jalapeno Blue Crab Cake. For the entrée, we divided the Rack of Lamb and I’m glad we did because the starters already provided plenty of food. On the other hand, I am also happy that we didn’t skip this main as the lamb was incredible. The kitchen really does an excellent job with the preparation and cooking of their meats. We asked for the lamb to be medium-rare and it came to us just as requested. The steak knife that was provided cut through the rack like butter and there was plenty of juicy meat on the bones, which isn’t always the case when ordering this dish. What I loved most was the strong Dijon mustard and crushed pistachio that crusted the lamb as it paired so well with the natural flavour of the meat. The brush of butternut squash puree and braised leeks were texturally appealing and gave the plate an artistic look. The side of sweet potato pave was a good starch to anchor the entrée, but there was so much that we couldn’t finish it. Having experienced both their lunch and dinner services, I can safely say that this establishment is another fantastic addition to Edmonton’s growing restaurant scene. The bright, new interiors and the views make it appealing, and the personable service (although, they can refill water glasses more regularly) is something I noticed and has stuck with me. For those who have yet to try The Phork, here are some potential incentives for you. Currently, the restaurant is offering $10 off lunch for groups of two or more during their Monday to Friday lunch hours. Every Tuesday they have half price off every wine after 4 PM, and Saturday evenings from 7 to 10 PM there is live music. I expect I’ll be back to indulge in beverages, more food and some music soon enough! It’s that good!